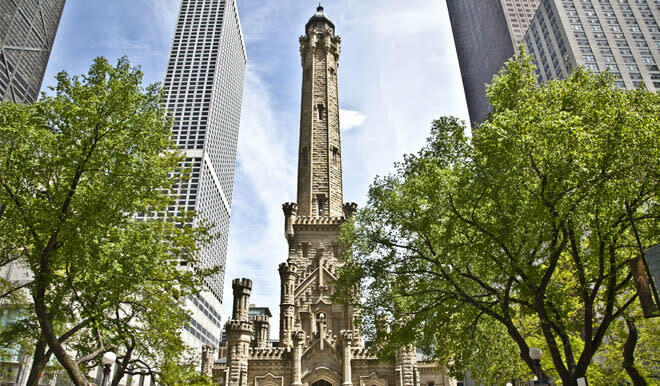 Built in 1869 by William W Boyington in a castellated gothic style, the Historic Water Tower is one of the most beloved City of Chicago landmarks. It was built to hide a 138 foot stand pipe that equalied pressure from across the street at the pumping station. The Historic Water is one of the only buildings to survive the Great Chicago Fire of 1871. It came to symbolize Chicago's "I Will" spirit as Chicagoans began to rebuild the city. Inside the Historic Water Tower today is the City Gallery, a art gallery ran by the City of Chicago.